Our Loughborough Central hotel is the ideal base for exploring this thriving and diverse university town known for its buzzing markets, for the Charnwood Museum and for the fascinating Loughborough Carillon. Enjoy a five course meal as you admire Charnwood's rolling countryside on the Great Central Railway steam train, have a refreshing walk in Beacon Hill Country Park or take a fuzzy alpaca for a walk at Charnwood Forest Alpacas. All rooms feature a comfy king size bed with four plump pillows and a cosy duvet. Guests can enjoy a wide variety of food and drink choices within easy walking distance from this hotel. Stay in one of 36 guestrooms featuring LCD televisions. Complimentary wireless Internet access is available to keep you connected. Bathrooms have complimentary toiletries and hair dryers. Conveniences include phones and coffee/tea makers, and you can also request irons/ironing boards. With a stay at Charnwood Lodge in Loughborough, you'll be within a 10-minute drive of Loughborough University and John Taylor Bellfoundry Museum. This 4-star guesthouse is 9.7 mi (15.6 km) from National Space Centre and 11.7 mi (18.9 km) from De Montfort University. 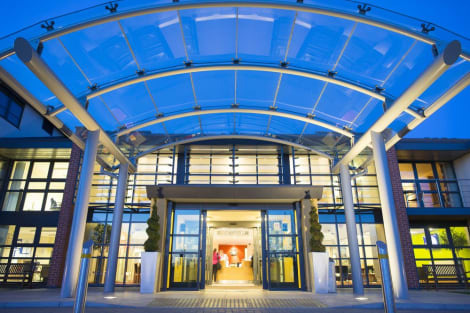 When you stay at The Link Hotel Loughborough in Loughborough, you'll be near the airport, within a 15-minute drive of Loughborough University and Donington Park Racing Circuit. This hotel is 12 mi (19.4 km) from National Space Centre and 17.9 mi (28.8 km) from University of Nottingham. With a stay at The Hunting Lodge - Restaurant with rooms in Loughborough, you'll be within a 10-minute drive of Loughborough University and Prestwold Hall. This 4-star inn is 8.5 mi (13.6 km) from National Space Centre and 10.5 mi (17 km) from De Montfort University. Relax at the full-service spa, where you can enjoy massages, body treatments, and facials. You can take advantage of recreational amenities such as a health club, an indoor pool, and a spa tub. This hotel also features complimentary wireless Internet access, wedding services, and a reception hall. Make yourself at home in one of the 78 guestrooms. Complimentary wireless Internet access keeps you connected, and satellite programming is available for your entertainment. Private bathrooms have complimentary toiletries and hair dryers. Conveniences include phones and desks, and housekeeping is provided daily. Full breakfasts are available daily from 7:30 AM to 9 AM for a fee. Make yourself at home in one of the 5 guestrooms. Complimentary wireless Internet access is available to keep you connected. Conveniences include coffee/tea makers and portable fans, and housekeeping is provided daily. Loughborough is a university town within the Charnwood borough of Leicestershire, and is the largest Leicestershire settlement outside of Leicester. The town boasts much to do, from shopping, eating out and historic buildings with many attractions further outside the town itself. We have a number of Loughborough hotels from which to explore the area. The first mention of Loughborough appears in the 1086 Domesday Book where the town is mentioned as having eight villagers, sixteen smallholders and fifteen freemen across thirty-nine households. This was then considered very large. In 1841 a young cabinet maker called Thomas Cook declared Loughborough as a destination for the first ever package tour for a temperance group from Leicester. Loughborough is also home to the world's largest bell foundry, John Taylor Bellfounders, which made the bells for York Minster and St Paul's Cathedral in London. There is more to Loughborough and the surrounding areas than just shopping and history, and train enthusiasts should visit the Great Central Railway, the only double track mainline heritage railway in the UK. See vintage full-size steam engines passing each other on the tracks, or take part in a themed event such as a 1940s Sunday lunch or a murder mystery trip. Eight miles away is Coalville, home to the Snibston Discovery Centre, an award-winning interactive museum specialising in science and technology, engineering, transport, fashion, history and mining. Based in the former Snibston Colliery, it comprises seven interactive galleries, children's outdoor play area, water play area, under 5s section, café, shop and vintage travelling theatre. Boldly go where 2.4 million have gone before at the National Space Centre in Leicester, the UKs leading space science and astronomy attraction. See one of the only known Soyuz spacecraft in Western Europe, along with six galleries of exhibits and visitor activities covering space flight, astronomy and cosmology. There is also a three-dome cinema and planetarium, gift shop and restaurant, with the latter being situated beneath the two nozzles of the Blue Streak and PGM-17 Thor rockets. Being a university town, there are great offers throughout the town when it comes to food, and whether you want pizza, pub grub, a curry or good old fish and chips, it's all covered. Try The Paget Arms or Blacksmiths Arms for a traditional pub meal in a cosy setting or sample some delicious Turkish cuisine at Pashazade Meze and Grill Bar. Salim's Indian Restaurant offers some of the best curries in the area while Caravelli Italian Restaurant will give you a fantastic plate of pasta with a warm welcome.